Just before Thanksgiving, two separate car accidents occurred on I-10, shutting down parts of the highway and leading to several injuries and two deaths. The highway has already made it to the top ten list of the most dangerous highways in America for the amount of car accidents that have taken place on it. In the first accident, the driver of a Kia Soul carrying three other passengers was heading eastbound on I-10 when he lost control of his vehicle (for unknown reasons,) causing the car to go off the road and overturn several times. Jacksonville resident Harold Payne, who was a passenger, was killed, while the other three in the car were injured. Only one passenger, a 12-year-old boy, was wearing a seatbelt. Less than an hour later, a second crash occurred in the eastbound lanes. 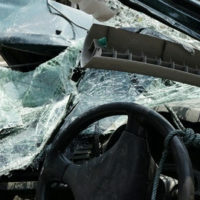 Thirty-six-year-old Callie Crump was sitting in stopped traffic when her car was rear-ended by 47-year-old Wanda Jones. The impact of Jones’s car killed Crump and also caused her car to crash into the vehicle in front of her, which was driven by a 77-year-old man. His vehicle then crashed into the Chevy in front of him. The driver and three passengers of the Chevy escaped without injuries, but the 77-year-old man was seriously injured. The impact of the accident caused Jones’s car to flip over two vehicles and land on top of the Chevy, inflicting her four passengers, which included a two-year-old and an infant boy, with severe injuries as well. According to research from the National Safety Council, your chances of dying in a car crash double for every 10 mph you travel over 60 mph. The reason behind this increase has to do with a car’s kinetic energy – when you accelerate your car, you are also greatly accelerating your car’s kinetic energy. A car’s kinetic energy depletes when a car is stopped by a driver applying the brakes. However, in cases like the above accidents, where cars are abruptly stopped by slamming into another vehicle, the force of impact can have grave consequences for all people in the car. Ms. Jones’s car was traveling at a speed fast enough to cause several cars to rear-end each other, as well as send her vehicle air-borne into another car. Her actions resulted in one fatality and grave injuries to six others. Accidents can, and do, happen anywhere. When an accident occurs on a highway, where people are usually driving at speeds of 55 miles per hour or more, these crashes can have grave end results. Be sure to practice safe driving; should you be involved in an accident with a driver who was not so careful, call a personal injury attorney. The attorneys at Gillette Law, P.A. in Florida and Georgia want justice for safe drivers who are injured as a result of another person’s negligence. We will make every effort to ensure you are awarded damages for your medical bills, pain and suffering, and wages lost at work. Call us today.